Laura O’Kane founded Paws and Affection in August 2013. Laura is the Executive Director of the organization and spends her time raising funds to care for and train the P&A team of dogs. She manages the day to day activity of the organization planning events, working with volunteers, and meeting potential donors. She works closely with the Program Director, Susie Daily, writing curriculum, creating marketing materials, and planning for the future. Laura is a Certified Professional Dog Trainer – Knowledge Assessed (CPDT-KA) and a member of the Association of Professional Dog Trainers (APDT). Laura spent time in the classroom assisting in the training of in-home pets in basic obedience and manners. She worked with clients, helping them understand the basics of positive dog training, making their relationships with their dogs easier and more rewarding. Prior to starting Paws and Affection, Laura was a manager at two different major retailers in the Philadelphia area over the course of 10 years. She has a BS from Virginia Tech in Management with a minor in Business Administration.In September 2011, Laura completed the Teach the Teacher Course at Canine Assistants in Atlanta, GA under the direction of Jennifer Arnold. Laura and her husband Chad live outside of Philadelphia with their 2 children. Wrote and taught 11 different group class curricula ranging from New Puppy Training to Therapy Dog Training to Tricks and Agility. Helped families create behavior modification plans to improve their relationships with their dogs. Susie is a Certified Professional Dog Trainer (CPDT-KA) and a Professional Member of the Association of Professional Dog Trainers (APDT). Jessica Gwiszcz is the Marketing Coordinator at Paws and Affection. Jess is a recent graduate from La Salle University with a degree in Psychology. While in school, she volunteered at P&A starting in early 2017. That summer, she completed the P&A Internship Program. She then returned as an experienced volunteer for the rest of the 2017/2018 school year. In May 2018, Jess was hired as our Marketing Coordinator. 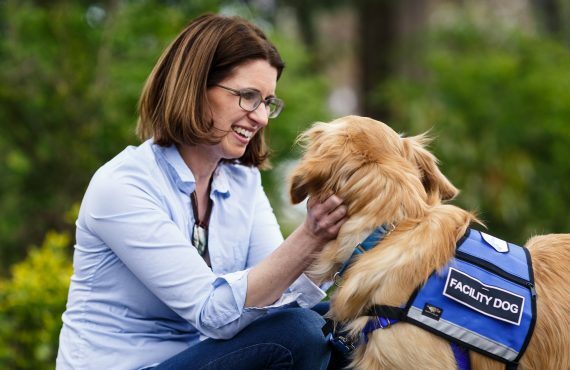 She works closely with Laura and Susie to facilitate day to day tasks as well as help with events and outreach to increase awareness of the mission of Paws and Affection. Jess also helps run the P&A social media accounts so as to keep followers up to date on the great work being done at Paws and Affection. Jen joined Paws and Affection in March 2018. 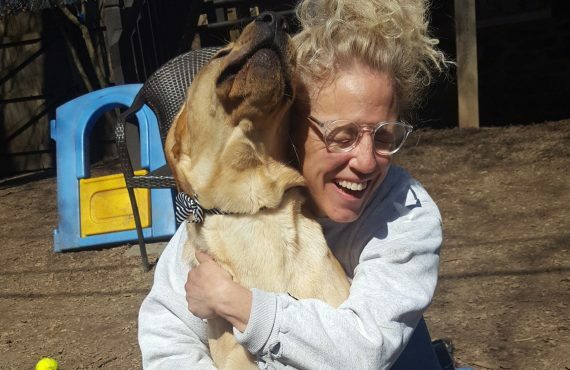 Her energy, lifelong adoration, and devotion to dogs, coupled with our exercise and training program, makes Jen the perfect Paws and Affection team member. All the pups took to Jen immediately due to her enthusiasm for all of their successes and just plain having fun! Jen graduated from the University of Hartford with a degree in Sociology. When she is not with our pups, she works as a local Realtor. Jen and her husband Dan have two children, Emma and Sam, which make Jen both a hockey mom and a barn mom. Her home is filled with animals to dote on: two dogs, three cats, one horse, hermit crabs and Koi fish that enjoy being hand fed. There’s always plenty of love and fun to go around!